Background Diabetic education can have significant effects in improving glycemic markers in patients with diabetes. This study sought to determine if the Diabetes Boot Camp, a novel 2-hour, intensive educational program by a multidisciplinary team, was effective in lowering mean hemoglobin A1c (HgA1c) levels in diabetic patients when compared to the standard of care. Methods The research design was that of a retrospective cohort study. The Diabetes Boot Camp population was defined as all diabetic patients referred to the boot camp clinic from the 10 physicians referring the most patients to the clinic from August 2009-August 2010. Three control populations were randomly selected from the same physicians' diabetic patients identified in the Ochsner primary care diabetes database during the same period. Pre- and postintervention HgA1c measurements on the same patients in all groups were analyzed. Control populations studied included an overall group, patients with HgA1c >9%, and patients with HgA1c ≤9%. Results Overall, the Diabetes Boot Camp cohort showed a significant decrease in mean HgA1c of 1.25% versus 0.11% compared to the control cohort (P<0.001). In the other analyses, Diabetes Boot Camp patients with HgA1c >9% and those with HgA1c ≤9% had statistically significant reductions in HgA1c compared to the control groups (P<0.001). Conclusion An intensive 2-hour multidisciplinary diabetes clinic demonstrated significant improvements in glycemic control as measured by HgA1c compared to standard care. Given the increasing costs and prevalence of diabetes in the US, self-management programs have been recommended as an essential tool for improving quality of life for those with diabetes.2 Such diabetes self-management education has been shown to be most effective when delivered by a multidisciplinary team with a comprehensive plan of care.3 In motivating patients, such a team frequently focuses on principles of diabetes pathophysiology, the role of hyperglycemia in long-term complications, the asymptomatic nature of hyperglycemia, and the various treatments to help control diabetes.4 However, because of providers' and patients' time constraints, providing adequate education on diabetes self-management continues to be a significant challenge. To better address the educational needs of patients in the Ochsner Internal Medicine Outpatient Clinic, a multidisciplinary team was established to implement a Diabetes Boot Camp. This special clinic was designed to meet the needs of patients who required more intensive education than could be provided in a routine office visit and whose personal time constraints prevented them from attending the more comprehensive multiday, ADA-certified educational programs offered by the Ochsner Diabetes Institute. This retrospective cohort study compared the effects of the Diabetes Boot Camp with the standard of care on the hemoglobin A1c (HgA1c) of patients with diabetes in an internal medicine practice. The Ochsner Institutional Review Board reviewed and approved the study (IRB 2010.163.B). The study was performed at Ochsner Medical Center, New Orleans, Louisiana, in the Internal Medicine Outpatient Clinic. The exposed population was defined as all diabetic patients referred to the Diabetes Boot Camp clinic from the 10 physicians referring the most patients to the clinic from August 27, 2009, to August 26, 2010. Three separate control populations were randomly selected from these same physicians' diabetic patients identified in the Ochsner primary care diabetes database during the same period. The control populations did not include any patients who were referred to the Diabetes Boot Camp. Data collection occurred via electronic capture of the relevant data from the electronic medical record. The data were verified by randomized chart review. Pre- and postexposure HgA1c measurements on the same patients in all groups were analyzed. Subpopulations of the Diabetes Boot Camp cohort—patients with HgA1c >9% and patients with HgA1c ≤9%—were compared to 2 control groups with the same degrees of glycemic control (HgA1c > or ≤9%). 1. In the group of patients with HgA1c >9%, was there a greater decrease in HgA1c among the patients receiving care in the Diabetes Boot Camp compared with those receiving the standard of care? 2. In the group of patients with HgA1c ≤9%, was there a greater decrease in HgA1c in the patients receiving care in the Diabetes Boot Camp compared with those receiving the standard of care? Patients were considered eligible for the exposed group if they had had an HgA1c test performed within 6 months of the Diabetes Boot Camp visit and if they completed at least 1 visit with the Diabetes Boot Camp. Additionally, a subsequent HgA1c had to have been performed within the 6 months following the Diabetes Boot Camp visit. The preexposure HgA1c value in the Diabetes Boot Camp group was defined as the HgA1c value obtained at the patient's last visit before the Diabetes Boot Camp visit, but within 6 months of the visit. The postexposure HgA1c value was defined as the first HgA1c value obtained following the Diabetes Boot Camp visit and within 3-6 months of the visit. Patients were selected for the control groups from among the same 10 physicians whose diabetic populations were eligible for enrollment in the exposed group. A random selection of 10 diabetic patients from each physician's diabetic patient panels comprised the control groups for each of the study populations. The 3 control groups for each of the 3 study questions also must have had a previsit HgA1c, a standard care clinic visit, and a subsequent HgA1c measurement. The preexposure HgA1c value in the standard of care group was defined as the first HgA1c value reported following August 27, 2009, and within 6 months of the standard of care visit. The postexposure HgA1c value was defined as the next reported HgA1c value within 3-6 months after the standard care clinic visit. The control groups were assembled from the same physician panels to prevent bias relating to different clinic sites or physician-related variability. The exposure of interest, the Diabetes Boot Camp, was the only variable consistently unique to the groups. The exposure consisted of 4 separate, consecutive 30-minute visits with a multidisciplinary team. During those 2 hours, each patient was individually evaluated by a physician or nurse practitioner, a pharmacist, a nurse/health coach, and a dietitian. The clinic was set up so a professional from each discipline rotated through the patient's room. Patients received welcome letters the week before their appointment. The office staff called the patient the day before the appointment to remind the patient of the 2-hour appointment and to bring all medications, their glucometer, and any blood glucose logs. Family members involved in the care were encouraged to attend. On the day of the visit, the medical assistant or nurse coordinator greeted the patients and gave them the list of professionals involved in their care. A nurse coordinator managed the time and provided a smooth transition for the patient from professional to professional. The pharmacist evaluated the patient's present medications, any drug interactions, money constraints, or side effects. The pharmacist's assessment also included recommendations for adjustments related to comorbidities, renal or liver disease, and generic utilization goals. The nurse/educator reviewed the plan of care of diabetes management: basic pathophysiology, blood sugar monitoring, treatment of hypoglycemia, treatment of hyperglycemia, self-care, when to call the physician, and follow-up care. The nurse could set up an appointment for intensive diabetic education with the Ochsner ADA-certified education program. The nurse could also arrange for the patient to follow up with a nurse visit to emphasize specific learning goals. A registered dietitian (RD) addressed individual nutrition needs, taking into account any personal and cultural preferences and the patient's willingness to make changes. A typical medical nutrition therapy (MNT) session in this clinic began with the RD addressing any questions the patient had about nutrition and diabetes. The RD suggested a goal range for carbohydrate intake at meals and reviewed food label information during the course of this MNT visit. Clinic participants received written material on the subject of carbohydrate counting from the ADA's Nutrition Care Manual and a 6-day sample meal plan containing either 30-45 or 45-60 grams of carbohydrate per meal.5 Patients also received an additional list of nutrition tips for the person with diabetes that includes foods indigenous to south Louisiana. The RD offered and scheduled follow-up MNT if the boot camp participant desired ongoing care. Prior to their departure, patients received a report card that explained the status of their disease and included important follow-up points. Patients also received several basic diabetes education handouts specific to their needs. Return appointments with their primary care providers were arranged. Complex diabetic patients were offered a referral to the endocrinologist. The visit was completed when the nurse coordinator ensured that all follow-up appointments had been made, appropriate vaccines given, and medication and supplies provided. Standardized documentation in the chart was reviewed during the session using a preprinted form with a checklist and areas that allowed for writing a short narrative. The medical records department scanned the form into the patient's chart. The mean HgA1c differences between the control cohort and boot camp cohort at each period were compared using t tests. We also tested the effect of time within each cohort. For instance, for the control cohort, we computed the difference in means at baseline and follow-up visits to assess statistical significance. P values less than 0.05 were considered statistically significant. All analyses were performed using Stata v.11 (College Station, TX). The results are summarized in Table 1. The overall HgA1c mean at baseline was 7.9% ± 1.98% and 7.2% ± 1.4% at follow-up (data not shown). A total of 121 patients were referred to the Diabetes Boot Camp, and 95 patients were in the overall control cohort. 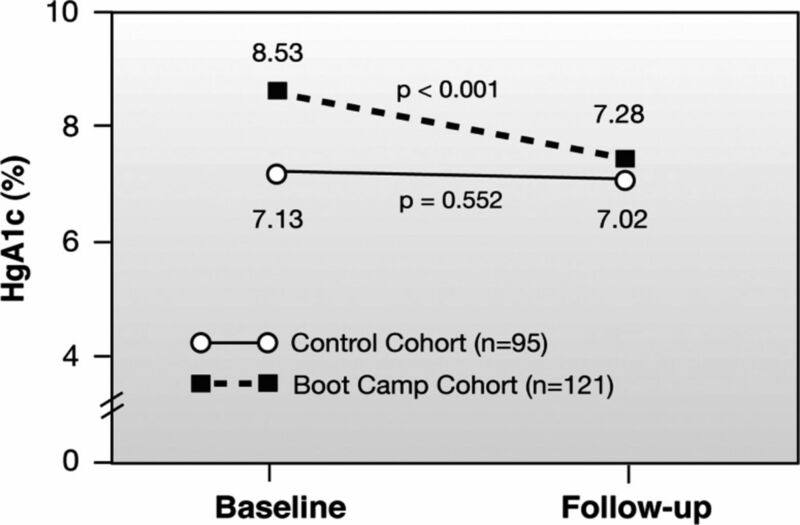 The mean HgA1c of the Diabetes Boot Camp (n=121) group significantly improved over time, (P<0.001) with values decreasing from 8.53% to 7.28% when baseline and follow-up periods were compared (Figure). The mean HgA1c of the control group (n=95) showed no significant change from 7.13% to 7.02% (P=0.552). In the analysis of those with HgA1c >9% (Table 2), both the boot camp cohort subgroup (n=43) and the control group (n=49) showed significant improvement in HgA1c, P<0.001 and P=0.028, respectively. However the magnitude of the improvement in the boot camp group (2.78% ± 0.40%) was significantly greater than the magnitude of improvement in the cohort group (0.73% ± 0.33%). Likewise, in patients with HgA1c values ≤9% (Table 2), the boot camp cohort subgroup (n=78) showed improvements in HgA1c from 7.16% to 6.75% (P<0.002) from baseline to follow-up. However, mean HgA1c values rose in the control group (n=129) with HgA1c values ≤9% from 7.13% to 7.52% (P=0.009). Again the magnitude of improvement in the boot camp group was significantly greater than in the control group with the difference being 0.41% ± 0.07% versus −0.40% ± 0.15%, respectively. This clinic was unique in that it provided a structured approach with 4 consecutive 30-minute visits with various healthcare specialists to advance the patient's understanding of his or her disease and to provide customized recommendations to improve management of the patient's diabetes. Furthermore, the clinic addressed an important unfulfilled need by patients who needed diabetic education and management but were unable to attend a formal ADA-certified educational program for a variety of reasons. Frequently, the patient's primary care physicians were unable to personally provide such services during routine office visits because of time constraints and a lack of expertise in some of the multidisciplinary healthcare areas. This study had several potential limitations. There may have been a self-selection bias for patients who attended the Diabetes Boot Camp. The participants may have been more inclined and motivated to engage in self-education than those in the usual care group. Greater utilization of the Diabetes Boot Camp as a means of initiating insulin to manage poorly controlled diabetic patients may also have been a factor. Referral by physicians to the clinic for initiation of insulin would be expected to result in significant improvements in HgA1c compared to the standard of care if the standard of care group had fewer initiations of insulin therapy. The study also had a relatively short-term follow-up of less than 6 months. Sustained differences between the Diabetes Boot Camp and standard of care cohorts will be explored in follow-up studies. Clinics with access to multidisciplinary professionals such as nurses, pharmacologists, physicians, and dietitians would be able to institute such a program to help manage their diabetic patients with special needs. In our experience, patients have been quite satisfied with the boot camp clinic. Physicians referring to the clinic have also been satisfied with the services rendered. The physicians have specifically commented on the time-saving features of the clinic that relieve the physicians of extensive educational visits with their patients. These results suggest that implementing an intense, 2-hour multidisciplinary clinic to provide disease management education to diabetic patients results in significant improvement in the patients' glycemic control during the first 6 months after the clinic. Improvements occurred in diabetic patients overall and in populations representing the patients' degree of glycemic control. Improvements were most marked in those with poor control. Such a clinic provides an important service in providing diabetes management education to patients who are unable to attend longer, multiple sessions that are certified by the ADA. Long-term results of this one-time visit to an intensive diabetes education clinic are not known at this time. Effect of the exposure of a diabetic cohort to the Diabetes Boot Camp compared to a control population. The authors wish to thank Dr Adriana Dornelles with the Ochsner Center for Healthcare Research for biostatistical assistance. Funding for this study of the Diabetic Boot Camp was provided by the Ochsner Department of Internal Medicine and the Ochsner research administration. (2011) Data from the 2011 National Diabetes Fact Sheet, January 26, 2011. http://www.diabetes.org/diabetes-basics/diabetes-statistics. Accessed August 8,. (1, 2011) Standards of medical care in diabetes—2011. Diabetes Care 34(Suppl 1):S11–S61, pmid:21193625. (1, 2010) National standards for diabetes self-management education. Diabetes Care 33((Suppl 1)):S89–S96, pmid:20042780. (2002) Educating patients: diabetes self-care. Nurse Pract, Suppl:16-23; quiz 23-24. (2001) Academy of Nutrition and Dietetics. Nutrition Care Manual, http://www.nutritioncaremanual.org. Accessed July 22,. (6 1, 2010) Medical clinics versus usual care for patients with both diabetes and hypertension: a randomized trial. Ann Intern Med 152(11):689–696, pmid:20513826. (2 8, 2011) Effectiveness of disease-management programs for improving diabetes care: a meta-analysis. CMAJ 183(2):E115–E127, pmid:21149524, Epub 2010 Dec 13. (1, 2008) Nutrition recommendations and interventions for diabetes: a position statement of the American Diabetes Association. Diabetes Care 31((Suppl 1)):S61–S78, pmid:18165339, Erratum in: Diabetes Care. 2010 Aug;33(8):1911. et al. (10 26, 2002) Interventions used in disease management programmes for patients with chronic illness - which ones work? Meta-analysis of published reports. BMJ 325(7370):925, pmid:12399340. (12, 2003) National Heart, Lung, and Blood Institute; National High Blood Pressure Education Program Coordinating Committee. Seventh report of the Joint National Committee on Prevention, Detection, Evaluation, and Treatment of High Blood Pressure. Hypertension 42(6):1206–1252, pmid:14656957, Epub 2003 Dec 1. (6, 2001) Medical nutrition therapy in type 2 diabetes. Nurs Clin North Am 36(2):203–216, pmid:11382560.